To Get Big-Rig Drivers, Senate Bill Would Give Keys To Teens Some trucking companies are having trouble finding enough interstate drivers. They say cutting the minimum driving age from 21 to 18 is a fix, but critics worry such a move would be a safety disaster. 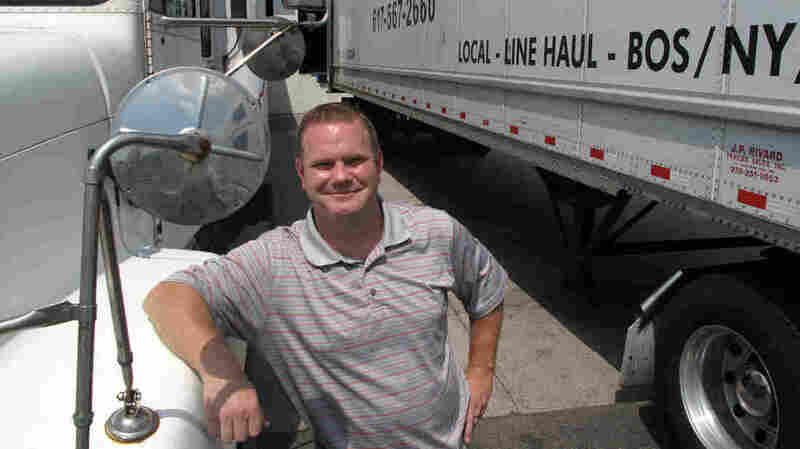 Eric Pennucci of Horizon Air Services, a Boston trucking firm, does not like the idea of 18-year-olds behind the wheel of tractor-trailers. Tractor-trailers have 18 wheels. But under current federal law, you can't be 18 years old and drive one across state lines. You have to be 21. The highway bill working its way through the Senate, though, would change that. "They want to allow 18-, 19- and 20-year-olds to drive big trucks. This is a terrible idea, and it will result in more crashes, more deaths and more injuries," says Jackie Gillan, president of Advocates for Highway and Auto Safety. She says 18-year-olds are more likely than older drivers to crash cars, motorcycles, trucks — vehicles of all kinds. So we shouldn't let them be interstate truckers. "Drivers between the ages of 18 to 20 have four to six times higher rates of fatal crashes," she says. Even some trucking companies don't like the idea. Up near Boston's Logan airport, Eric Pennucci walks along the loading dock at Horizon Air Services, a trucking firm. Big tractor-trailers are picking up and dropping off everything from Italian shoes to live lobster. Pennucci says all of his customers are in a hurry to get this stuff. "People in New Hampshire [say], 'I need my candles! The world will end if I don't have my candles!' " he says. There's a lot of stress in the trucking business, Pennucci says. Traffic causes delays, and he says truck drivers need to be experienced, calm under pressure and able to make good decisions. So he, too, does not like the idea of 18-year-olds behind the wheel. "We just wouldn't do it. Safety means a lot. I'm OK with having to wait till your're 21 to drive a tractor-trailer," he says. But some trucking companies are having a hard time finding drivers — and they don't want to wait. "One of the reasons that ATA supports this idea is because we have today in every state in the United States — at least in the lower 48 — we have 18-, 19-, 20-year-old truck drivers operating in the state," says Dave Osiecki, head lobbyist for the American Trucking Associations in Washington. Osiecki says under state law, 18-year-olds can already drive trucks. Federal law just bans them from driving across state lines into neighboring states. But if the logic to that is that these younger drivers shouldn't be hauling long distances, Osiecki says that logic doesn't hold up. "A driver 18-, 19- or 20-year-old today can operate a large truck from Philadelphia to Pittsburgh — over 300 miles in intrastate commerce wholly within the state of Pennsylvania — but he can't go three miles across the bridge from Philadelphia into Camden, N.J.," he says. "That doesn't make a lot of sense." So Osiecki says the Senate version of the highway bill would allow neighboring states to take part in six-year pilot programs. Drivers under 21 could drive 100 miles into neighboring states. But that would be the new limit. They still couldn't drive, say, from New York to California. "Those people who want to paint this as a completely radical idea and just opening the barn doors to these young horses to run, that's just inappropriate and unfair," Osiecki says. Still, safety advocates say this would expand the use of teenage truck drivers who are more likely to have accidents. And they worry that the 100-mile limitation could be removed down the road. In any case, Congress will pick the issue back up when lawmakers return from the summer recess.